Need something to protect that noggin' of yours? 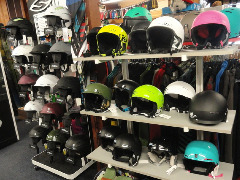 We have brain buckets galore including helmets from Smith, Giro, POC, K2, Anon, Lib Tech and Salomon. What separates us from the animals is our ability to accessorize - at least that's what I've heard. We have thin hats, thick hats, windproof hats and just plain fashionable hats! 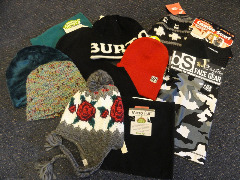 To go along with our hats, we have face masks, neck gaitors, scarfs, balaclavas and headbands from Turtle Fur, Black Strap, The Northface, Mountain Hardwear, Coal, Seirus and many many more. Have your gloves given up keeping your fingers warm? 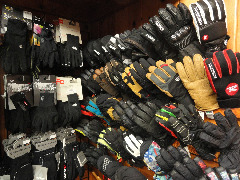 We have gloves and mitts from Swany, Burton, Gordini, Dakine, Mt.Hardwear, Black Diamond, Marmot, Spyder and The Northface. Just need a glove liner? We have that too! Lightweight, midweight and heavyweight liners - just the perfect one to fit under your glove or mitt or just to wear while taking a brisk morning walk! There is nothing worse than cold feet. We have just the right socks for your feet. Thin ones for those who have tight boots. Thicker ones for those whose boots have a little room in them. We have Merino Wool socks, socks absent of any wool and everything inbetween. Come find the perfect sock for you from Wigwam, point6, Hot Chilly's and Fits. We have all your goggle needs from large frames to small frames, from dark lenses for bright days to low light lenses for overcast days and everything in-between. Come check out our selection of goggles from Oakley, Smith, Anon, Scott, Giro and K2. Are you a do-it-yourselfer?? We've got tuning kits for your skis or boards that are perfect to get you started. Have a tune kit already and just need to replenish? We have that too! Wax, base cleaner, scrapers, edgers, ptex and our own special blend bulk wax. If you want to hang out with Bob in the basement to learn tuning basic - that can happen too. We have bags for your skis, bags for your boards and bags for your gear. 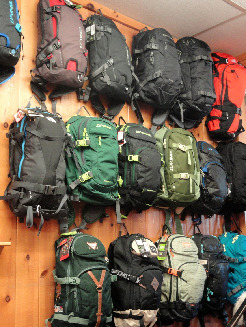 We have back packs for day trips, back packs that will carry your skis or board, and back packs to use as a school pack. We also have several different kinds of boot bags - boots on the bottom, boots on the side, boots only or boots in a back pack. Come find out which one is right for you.